Chicken and waffles aren't a duo we generally get excited about. Granted, we're not from the South, so it's possible the real thing has eluded us. Lazy attempts as ironic menu items around here have always left us feeling like the chicken and the waffle are two completely separate species, not meant to make sweet love in your mouth. But things done changed. Sweet Chick now has us thinking differently. A recent addition to the corner of N. 8th and Bedford Avenue in central Williamsburg, Sweet Chick is our kind of neighborhood spot. It specializes in fried chicken and waffles, but it's not a one trick pony. There's a full menu of simple, yet well executed Southern eats, a fun cocktail list, and great selection of local beer on tap. 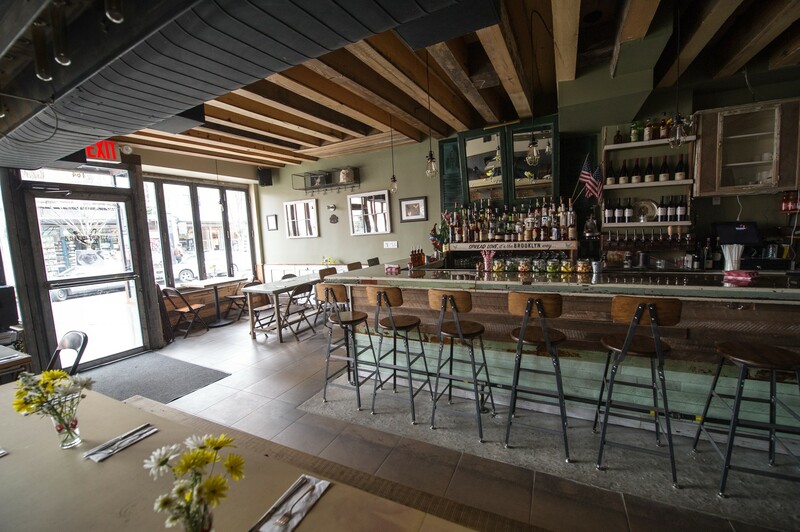 It's the kind of spot we gravitate toward, with a unpretentious vibe, good people, and a communal atmosphere. Expect to be surrounded by lots of tattoos and old school Outkast. Like, the entire ATLiens record too, not just Ms. Jackson. Sweet Chick can also be utilized as simply a watering hole -a solid place to hang and booze with friends. The kitchen is open until 2AM, which makes it one of the best Late Night Eats options around, perfect for a post-show hang at Music Hall of Williamsburg. We're not sure what the end game is here, but Sweet Chick has got the branding element to this whole niche food theme down. Think Meatball Shop, but for chicken and waffles. We'll assume expansion is inevitable, which is a good thing for all of us. Three small sloppy joe sandwiches, layered with pickles, flavor and love. These things are on every menu at Sweet Chick, and for good reason. They're an excellent snack. Sloppy joes are underrated. People freak out for the Sweet Chick Mac & Cheese. It's got three different types of cheese in it - gruyere, fontina and white cheddar - and comes with a ritz cracker crust. Order it. Nope, not a sandwich. A kale salad. A kale salad with massive, thick chunks of bacon on top. Needless to say, this is our kind of salad. When you come to Sweet Chick, you're ordering chicken and waffles. That's what you're here for. As we discussed in the intro, they pull off what we thought to be the impossible; the chicken and the waffle working in sweet harmony together. Waffles are tricky. They all look good, but rarely do they actually taste as good as they look. These waffles are bomb. Soft in the middle, crispy outsides, a vanilla flavored batter - it all compliments the crispy chicken perfectly. Add a little hot sauce, some syrup and maybe some butter if you want to get real crazy and you're good to go. Pay attention to the specials too, as there are always an assortment of different waffle options available. A bucket of three piece of fried chicken - a breast, a thigh and a big wing -served with a biscuit and a side of spicy collard green slaw. Life is good. The chicken isn't quite on the level of some of our absolute favorites like at Pies 'N Thighs, Blue Ribbon and Bobwhite, but this is high quality poultry. Made with seitan, which is essentially wheat gluten, the vegetarian fried chicken is passable even by non-vegetarian standards. It's on the dry side and doesn't pack nearly as much flavor as regular fried chicken, but it took us a couple bites to actually figure out which was which when we dug in. We liked that we could mix up our bucket of chicken with regular and vegetarian, that's good customer service right there. Brussels sprouts slaw with nuts and hominy is absolutely delicious, as is their spicy collard greens slaw, which comes in a wet, creamy sauce. Believe it or not, the pastry chef here comes from a history of well respected fine dining establishments, so make sure to save room. Double chocolate pudding, cookie jars and upside down pineapple cake will make it worth your while.